COACH Flemming Serritslev has named a strong side to take on visiting Tahiti in the first home-and-away clash of the ‘Road to Russia’ Fifa World Cup qualifiers in Port Moresby. Except for Jaime Woodlock, Raymond Gunemba and Wira Wama, the side includes seasoned campaigners Michael Foster, Francis Warisan, Alwin Komolong, Simon Emmanuel and Nigel Dabinyaba. Overseas players who made the squad include George Slefandorfas and Brad MacDonald. Serritslev said despite missing several stars from their Nations Cup campaign last year, he was confident his new squad could take football in the country forward. “The preparation has been very good. All the players have sacrificed their time to give their best for the country,” Serritslev said. 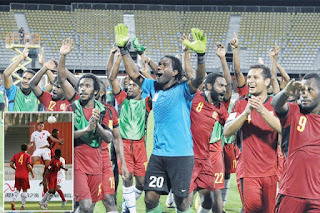 The Dane, who refused to comment on the PNGFA-FFPNG situation, said he was only focused on getting the Kapuls ready for their tilt at World Cup qualification. He guaranteed that the squad, who had been in camp for three weeks, would give their best against Tahiti. “We want a positive result to start our campaign and a win will be a bonus for the team,” he said. 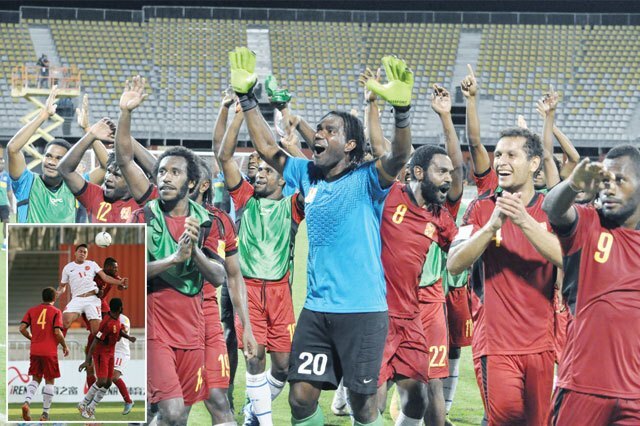 PNG and Tahiti played out a 2-2 draw the last time they clashed, which was at the Nations Cup last June in Port Moresby. The 70-year-old said two players would not be available for tomorrow’s fixture, with Raymond Gunemba sitting out the match due to two yellow cards he received at the Nations Cup in Port Moresby last June, while Woodlock needs to get clearance from New Zealand Football as he has represented that country in the Under-20 World Cup. There is no major injury except for Holland-based David Brown, who is nursing a head injury but will be alright to play against the Tahitians. Tahiti coach Ludovic Graugnard is equally confident of registering an away win tomorrow against PNG. The Frenchman said on arrival on Monday that he was confident of getting a win over the Kapuls at home. “We are here to beat the Kapuls in their homeland,” Graugnard said. He said he would be banking on the experience his players from national champion club Tefana. After a win and a loss to the Solomon Islands, the Tahitians are desperate to keep their World Cup hopes alive — and a win at the Sir John Guise Stadium is a must. “We have three points each after the game against Solomon Islands. “We are looking for a win to consolidate our position in our pool,” Graugnard said. “The message to my boys is clear — play according to our style, with the weather similar to Tahiti. Graugnard confirmed his side had been hampered with the absence of several senior and experienced players, who were committed to Tefana, who are one of the four finalists in the OFC Champions League in Auckland, New Zealand. The 39-year-old said he was not familiar with the PNG squad except for their notable stars in mid-fielder David Muta, defender Koriaik Upaiga and striker Tommy Semmy — all three are unavailable for the clash as they are aligned to the FFPNG through their club Hekari United. “I have watched and followed these players (Muta, Upaiga and Semmy) as they were the ones who helped Marist qualify for OFC Champions League, and are very experienced players in big games,” he said. But Graugnard was still wary of the Kapuls ability at home. “I know PNG are still a very strong side with a new crop of talent so we’ll see what happens tomorrow and work on that,” the Frenchman said. Kapuls: Ronald Warisan, Ila David, Kusuga Komolong (goalkeepers), Alvin Komolong, Felix Komolong, Samuel Kini, Philip Steven, Clement Willis, David Brown, Nigel Dabinyaba, Michael Foster, Abel Redenaut, Brad MacDonald, Jacob Sabua, Emmanuel Simon, Patrick Aisa, Richard Alois, Giwi Simon, George Slefandorfas.